BSB bound | hair, there and everywhere! So close, so very, very close to BSB! Sigh. I really need to buy a camera. Even though I have a perfectly good camera on my iPhone 5, I need a tripod where I can take photos of myself without the horrible “man in the mirror” shot. I hate those … but oh well, what are you going to do? I wanted to share my hair this morning. I realize I have not been taking a lot of pictures of my hair lately, which is the point of the blog, right? Here is my roller set hair in January … as you can see, it just at my shoulders. … and here it is now! Progress is definitely being made!!! I thought I would share a length check teaser. I roller sat my hair last night (more on this to come), so I had to stretch out a piece of hair so it wouldn’t be so curly. 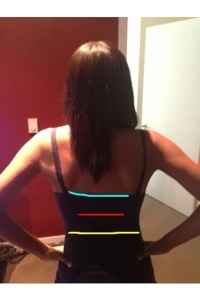 My longest length is inching towards that line on the blue tank!!! The first picture of me is in June. I love going back and seeing the progress I have made!! I knew the day would come when I had to do a trim. Not a dusting, but a trim. I am one who would get trims regularly, as the promised return of long hair was a lure too strong to ignore. However, since I started my hair journey, I have dusted as needed. Some times my ends needed it more than others, but I’m sure I have removed over 1.5 inches throughout the year. Well lately my ends have not been breaking as much, but I find them easily getting tangled, looking dry and appearing a bit broomstick-ish (flared ends). I decided I needed to get them trimmed. So I went to get my hair flat ironed. Sarah commented that an inch needed to be removed, but of course I wasn’t letting anyone do it but me! And I knew by her saying an inch, I would remove half an inch. Getting it flat ironed was a painful process since the iron was 400° and the way she was flat ironing it I could hear ends snap off. I just wanted to hurry up and get out of that chair. I think I may be going back to the place I went last week … Or better yet, learn how to flat iron my own hair!! Anywho, I came home and began the trim. I removed about half an inch in some places and some pieces were even an inch long! Hahhaha! Man, afterwards my hair looked soooooo much better. The comb didn’t get caught in it!! Now I am about .75-1 inches from BSB and 2 inches from BSL. I am still on track to make my respective goals for each length in December and February. Well this weekend was Nathan’s birthday and I wanted to flat iron my hair. I have gotten to the point where if flat ironing my hair every 4-6 weeks causes me a little damage, then so be it. I enjoy switching my look up! So to prepare my hair for the blow dry and flat iron session, I pre-pooed with Pantene Relaxed and Natural and vegetable glycerin for about an hour. I did a light clarifying session with the Alberto V-05 to remove any product buildup followed by my Alterna moisturizing shampoo. I mixed my Redken All Soft and Alterna Caviar conditioner and left it on my hair while in the shower. I then deep conditioned with my Alterna 10 hair masque for an hour. I blew my hair dry on low and cool using as my leave ins Alterna Caviar Perfect Blow Out, Roux 619, Alterna Photo Defense and a new heat protectant, Chi 44 Iron Guard. After it was blew out, I put on my Alterna Elixir and more Chi 44 Iron Guard. 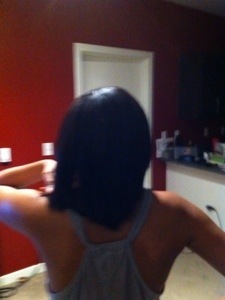 Then it was ready to have the flat iron! Sarah wasn’t available so I had to go to a salon close to home. 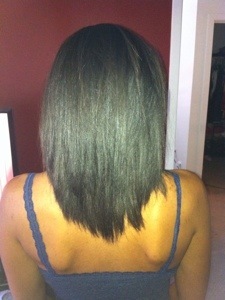 The lady introduced me to a new Joico flat ironed called K-PAK ReconstrRx VaporIron. It actually repairs your hair as it passes by filling in holes using its special reconstructor vapor. I was in awe!! But all in all, I have great news to deliver on the state of my hair. I am oh-so-close to BSB! 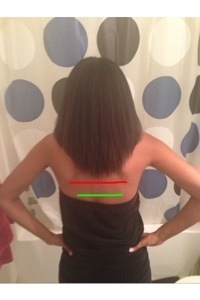 The red line in the picture is BSB and the green line is BSL. However, I am suffering from a horrible case of hairorexia. I see where my hair is growing, but it just doesn’t look all that long to me. I don’t think I will be “happy” until MBL!! Also, I am soooooo happy that my ends appear to be in really good shape. I have a fear of see-through ends, which happens as hair naturally weathers at the ends, but mine seem to be doing ok. I am sure I could use a trim, but I will dust when I relax in November. I also like how the ends have broke off into a lovely rounded U shape! Hahhaha! I don’t know when (or if) I will do a blunt cut. I like the look of the U and V shapes, so I think I will keep that for now. It also allows for reaching milestones faster. If I cut up to my shortest layer, I would be SL. No thanks. I am almost 9 months in my journey and doing alright. 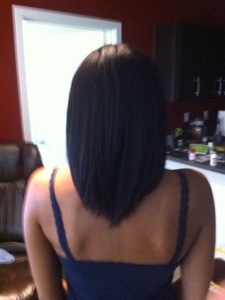 I think I will be BSL by my relaxer in February. I feel now I can be on autopilot and not rush to milestones and cut as much hair as needed, as I think the hardest part of the growing journey (unless I suffer a setback) is almost over. Man, that period from SL to APL to BSL … Ugh!!! It’s an 18+ month process! JBCO Challenge Results and new milestone made! Well I did a JBCO challenge for about two months and wanted to give a quick follow up. 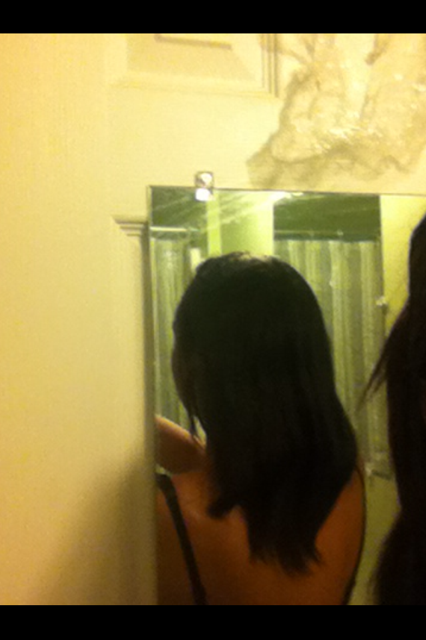 The back of my hair grew … as it always does. I could not tell a difference it the amount of hair that grew. My ultimate goal was to grow out the front where some pieces fall about chin length. Well, it grew out a bit, but not enough to make me happy. I did have to dust my hair twice this summer, so maybe that hurt a bit. I am getting new growth in the front, so why I am not seeing much progress is beyond me. I am going to start taking more pictures and monitoring the front of my hair’s growth progress! On another note, sans a few layers in the front and on the sides, I am officially full APL!!! Most of the hair on my head passes that line and I am claiming it!!!!!!!! WOO HOO! Now onto BSB by the end of the year!!!!!!!! I have about .5 inches left!